Robert Rey, President and CEO WHAT MAKES NVE SO UNIQUE? NVE is a full service community bank, with a robust suite of products and services. What distinguishes us is our customer-centric focus and our long history and corporate structure. 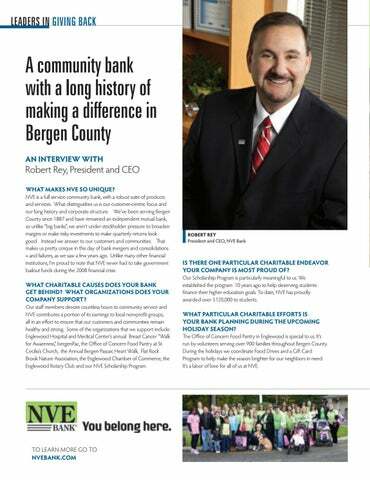 We’ve been serving Bergen County since 1887 and have remained an independent mutual bank, so unlike “big banks”, we aren’t under stockholder pressure to broaden margins or make risky investments to make quarterly returns look good. Instead we answer to our customers and communities. 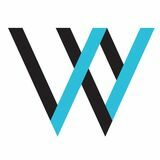 That makes us pretty unique in this day of bank mergers and consolidations – and failures, as we saw a few years ago. Unlike many other financial institutions, I’m proud to note that NVE never had to take government bailout funds during the 2008 financial crisis. IS THERE ONE PARTICULAR CHARITABLE ENDEAVOR YOUR COMPANY IS MOST PROUD OF? WHAT CHARITABLE CAUSES DOES YOUR BANK GET BEHIND? WHAT ORGANIZATIONS DOES YOUR COMPANY SUPPORT? Our Scholarship Program is particularly meaningful to us. We established the program 10 years ago to help deserving students finance their higher education goals. To date, NVE has proudly awarded over $120,000 to students. Our staff members devote countless hours to community service and NVE contributes a portion of its earnings to local non-profit groups, all in an effort to ensure that our customers and communities remain healthy and strong. Some of the organizations that we support include: Englewood Hospital and Medical Center’s annual Breast Cancer “Walk for Awareness,” bergenPac, the Office of Concern Food Pantry at St. Cecilia’s Church, the Annual Bergen Passaic Heart Walk, Flat Rock Brook Nature Association, the Englewood Chamber of Commerce, the Englewood Rotary Club and our NVE Scholarship Program. WHAT PARTICULAR CHARITABLE EFFORTS IS YOUR BANK PLANNING DURING THE UPCOMING HOLIDAY SEASON? The Office of Concern Food Pantry in Englewood is special to us. It’s run by volunteers serving over 900 families throughout Bergen County. During the holidays we coordinate Food Drives and a Gift Card Program to help make the season brighter for our neighbors in need. It’s a labor of love for all of us at NVE.